Snake printed feature leather and suede bikers vest is available in standard sizes listed in our menu , other sizes can be made to order. We manufacture this vest with a heavy duty metal toothed zipper , laced shoulders , adjustable side 4 plait round leather laces , with two full width suede pockets and internal wind gussets behind the laces. Black and White double whip laced braided leather edges. Select your size from our drop down menu , these sizes shown are available for immediate delivery , if you would like a custom made size please contact us for a quote. Priicing is up to a 3XL larger sizes cost more. 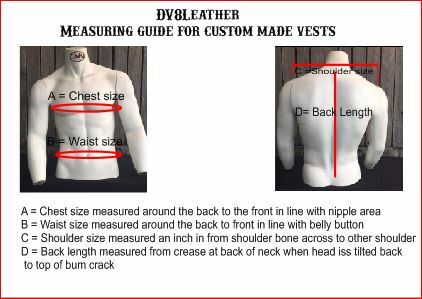 A 50 % deposit is required on custom made orders , please see our measuring guide below.